I am so glad that I discovered Dover body wash. Dove body wash is a wonderful product for dry or sensitive skin. I have dry and itchy skin, especially in the winter months. Most soaps just seem to make my skin worse. Dove Body Wash sooths my dry skin and I do not feel itchy after a shower. Unlike most moisturizing body washes that I have tried, Dove seems to rinse clean without leaving a sticky or moist feel on the skin. The scent is very mild, but pleasant. My husband also likes to use the Dove body wash, so it is nice that it is not to perfumy or strong scented. One bottle will last and last. I highly recommend Dove body wash to anyone with dry skin. It leaves you feeling clean without overdrying your skin. I am willing to pay anything to buy Dove body wash. It is such a gentle cleaner that you can use it even if you have sensitive skin. I have been using it for 6 months now. I sometimes try experimenting with different brands body washes but always end up coming back to Dove. It's my absolute favorite and I cannot do without it. After a shower i don't need to use any body lotion anymore unless i want to LOL!! 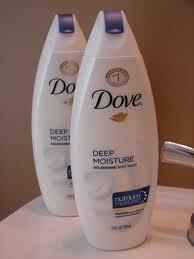 Dove Body Wash, Nourishing, Deep Moisture gives off a really pampered and luxurious feeling. I love to use it everyday! 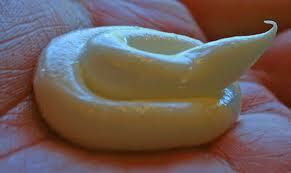 It leaves me feeling really moisturizer. Water, Glycine Soja (Soybean) Oil or Helianthus Annuus (Sunflower) Seed Oil, Sodium Lauroyl Isethionate, Sodium Laureth Sulfate, Cocamidopropyl Betaine, Lauric Acid, Stearic Acid, Glycerin, Fragrance, Sodium Isethionate, Lauryl Alcohol, Tallow Acid or Palmitic Acid, Guar Hydroxypropyltrimonium Chloride, DMDM Hydantoin, Methylisothiazolinone, Tetrasodium EDTA, Etidronic Acid, Iodopropynyl Butylcarbamate, BHT. I agree with you this is the best body wash ever!!! !